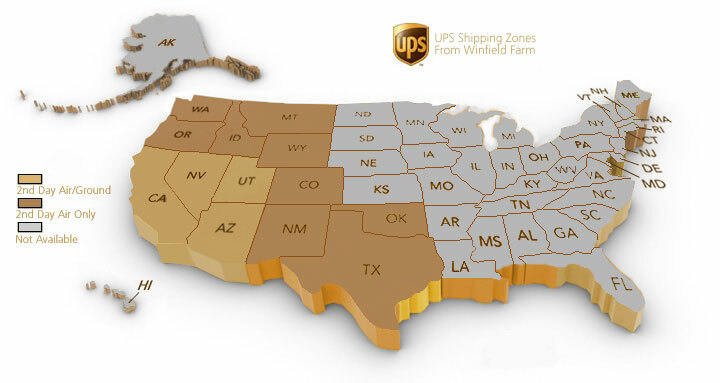 Where We Ship — We ship to CA, NV, UT, AZ, OR, WA, ID, CO, NM, MT, WY, TX, OK via UPS Ground and Air. Local deliveries in the Buellton – Santa Barbara area by special arrangement. Shipping Time — Your shipping time will vary depending on the shipping method selected. These are estimated delivery times based on days the shipment is in transit, not from the date the order is placed. We do not ship on New Year’s Eve, New Year’s Day, Memorial Day, 4th of July, Labor Day, Thanksgiving Day and the day after, Christmas Eve or Christmas Day. Packaging and Handling — All products are shipped frozen packaged in gel iced, insulated carton. The handling fee included in the price covers the additional materials and weight of each package as determined by UPS. UPS Shipping — UPS shipping offers both Air and Ground rates to CA, NV, UT and AZ although it is recommended to select the ‘guaranteed fastest option’ offered by UPS. Shipping to OR, WA, ID, CO, WA, MT, WY, TX and OK require 2nd Day Air only. Shipping costs, shown below, have been determined by the total order amount.